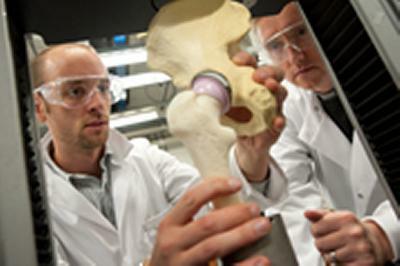 An innovative partnership to develop novel hip replacement implants, using University of Southampton research, has won a prestigious business award. The resulting design consists of a large bearing ceramic hip replacement implant designed specifically for a young patient, to help prevent dislocation and be more compatible with living tissue. The project, which partners the Bioengineering research group at the University of Southampton with Finsbury Orthopaedics Ltd, was selected as the Best Knowledge Transfer Partnership for the South East region by the Technology Strategy Board (TSB) at the Innovate 2011 Conference this week. Associate for the KTP with Finsbury Orthopaedics Ltd, Dr Alex Dickinson, has recently received an Engineering and Physical Sciences Research Council (EPSRC) Doctoral prize from the University to fund the next stage of his research. The project also supported the formation of a spin-out company from Finsbury Orthopaedics; Aurora Medical Ltd., which is continuing this work. The two award-winning projects, whilst both providing different services and solutions, both demonstrate the sharing of knowledge between the University of Southampton and businesses, for commercial, academic or social benefits.